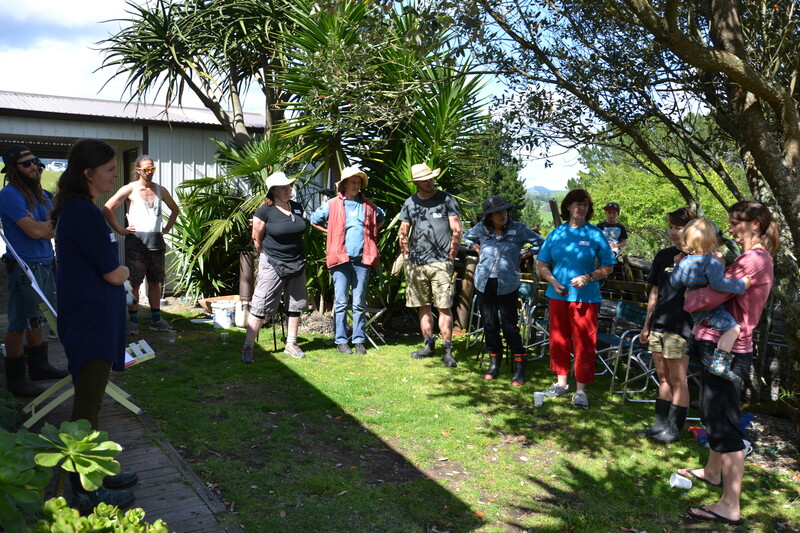 Upwards of 25 people came to Turangi last sunday on what was a hot dry, and windy spring day. The site they came to work on was the front lawn of a typical hydro-house. This was one of many houses in the town moved on site for the Tongariro Power scheme in the 1960’s-70’s. 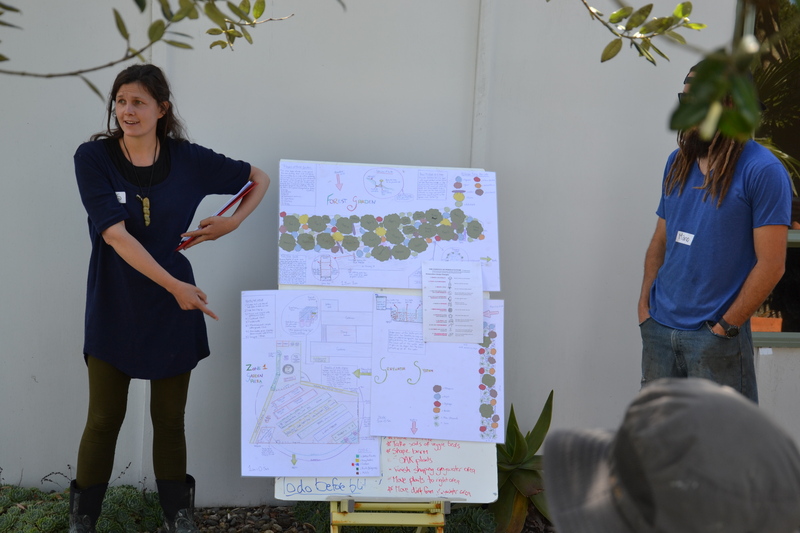 The concept design for the site included the front lawn as a perennial food forest system – a great sustainable solution for a busy professional couple with little spare time. 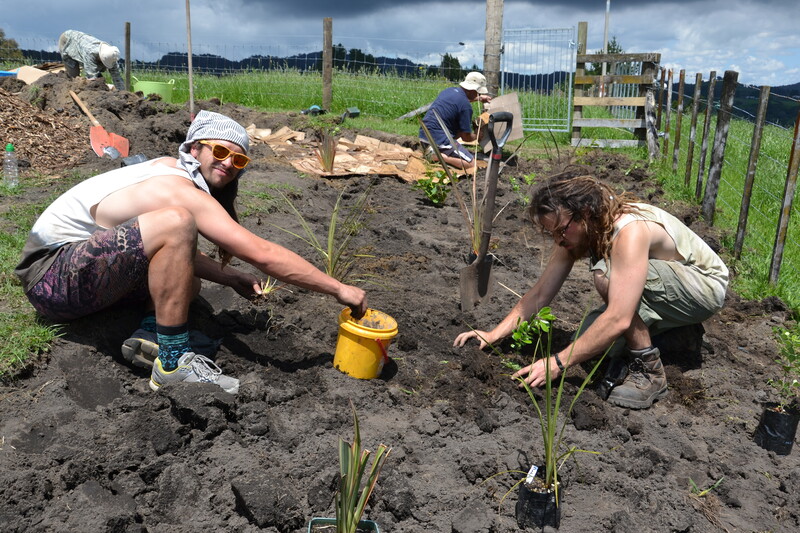 However, Turangi is renowned for poor and extremely free draining pumice soil and a cold climate. It snow occasionally in winter as the town is 340m above sea level. However this north facing sloped front lawn is a ideal suntrap, the house gives it excellent shelter from the cold southerly winds. 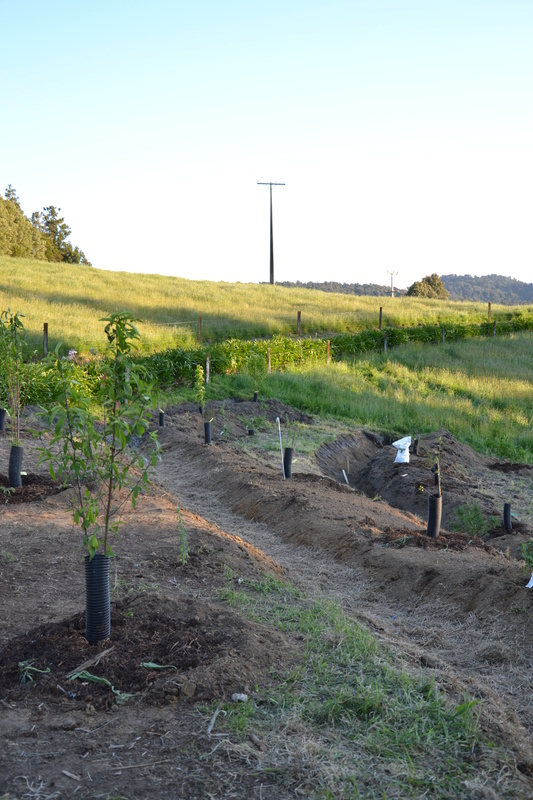 To alleviate water loss in the highly free draining soil, teams helped establish a combined Hugelkultur swale system. Stormwater from roof runoff was tapped into and piped to swales dug on contour above new berms. The berms were made from turf dug out of the swales and from trenches dug for wood which was buried under them. This waste wood was sourced locally from the fisherman’s track by the Tongariro river. There wayward gardeners had dumped pruning’s so these were put to good use. As the buried wood eventually rots, it will act like a sponge to absorb winter rains to sustain the fruit trees and food forest plants through the summer drought. 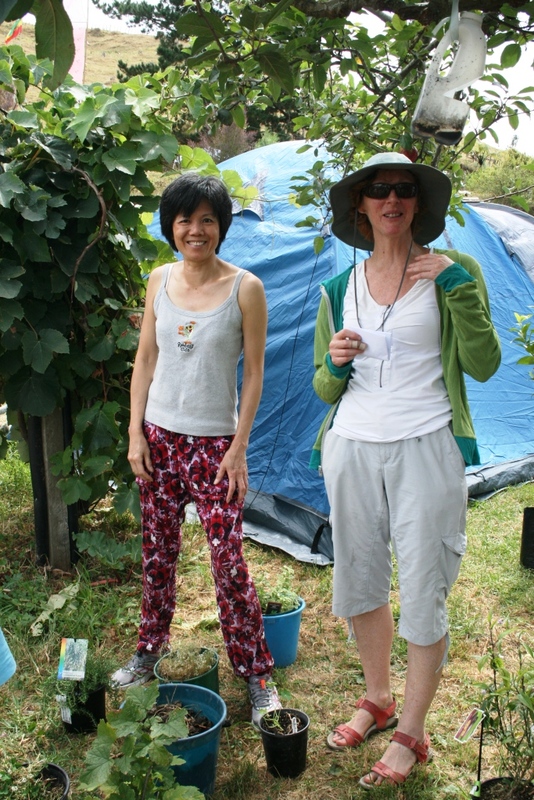 Much of the food forest is planted with deciduous fruit to ensure the hosue isn’t shaded and particular care was taken in the design to ensure morning sun would still enter the main living space window. All involved had a great day with many young people new to permablitz having attended the day. 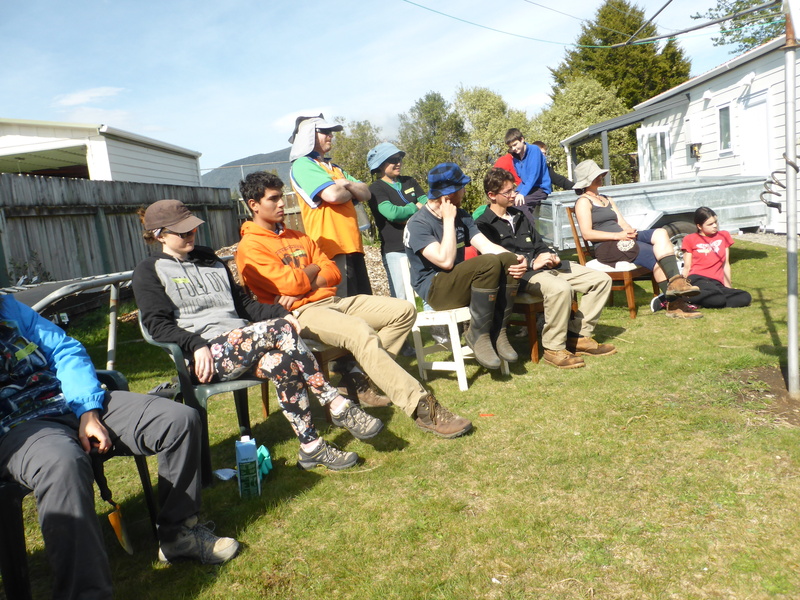 The was a large international contingent of volunteers from Awhi farm and also staff from the Hillary Outdoor education center. 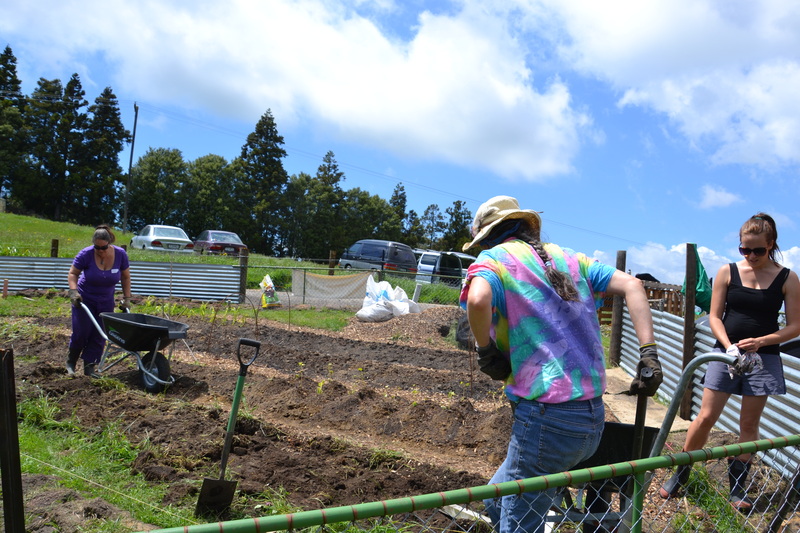 It is hoped this event and local interest in the site will lead to further development of edible gardens at a Turangi Marae. 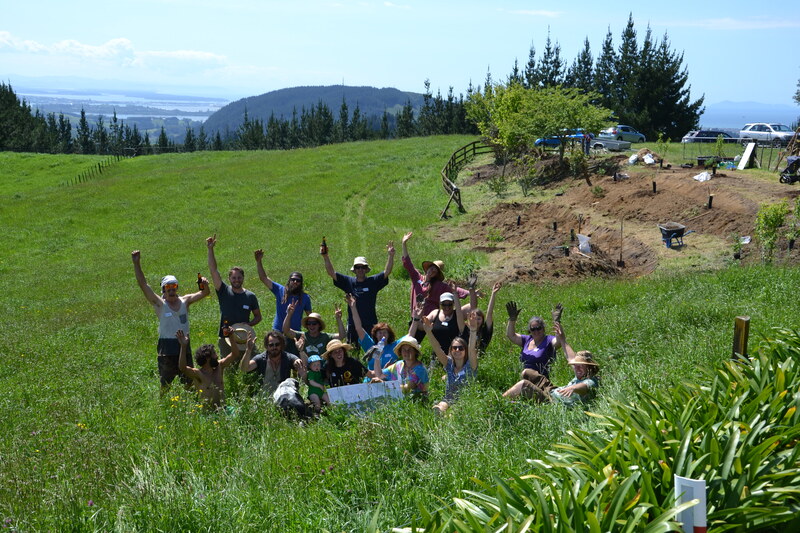 We are hoping to hold a massive multi-day permablitz someday to give back to the Turangi community, many of whom are the descendants of the visionary people that gifted NZ it’s first National Park. (Tongariro NP) Watch this space! 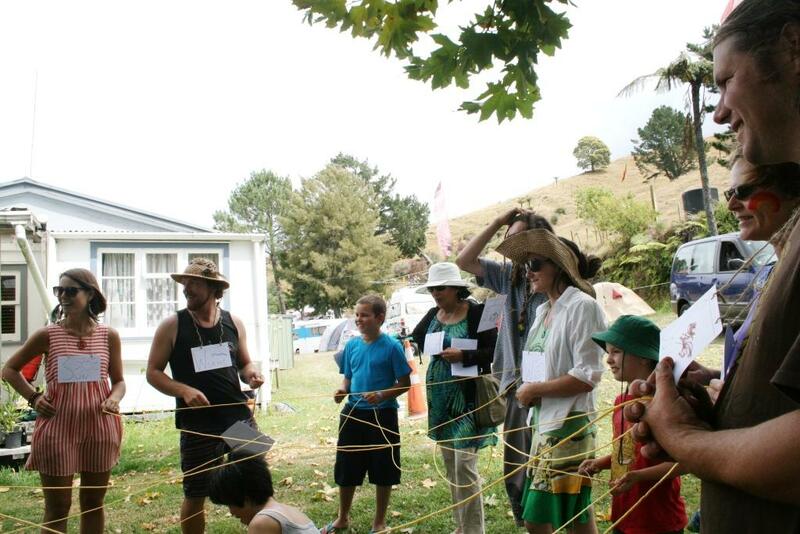 On July the 12th The Rock hosted the 20th Bay of Plenty Permablitz – and what a day it was! The sun was shining, the wind was light, and smiles radiated from end to end of The Rock’s busy pathways. 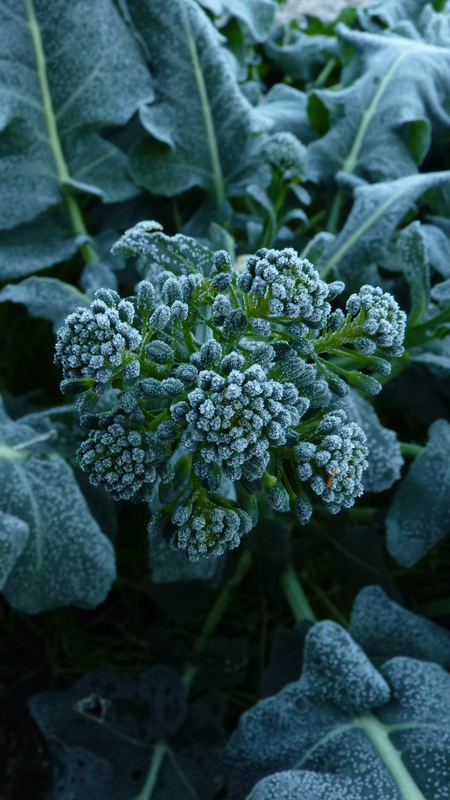 The day started off frosty, with frozen hoses and ice coating every minute surface of the vegetables, creating a crispy white wonderland (see photos!). The buzz grew as people started arriving, greeting one another, pouring hot teas, labelling tools and laying down gifted plants. 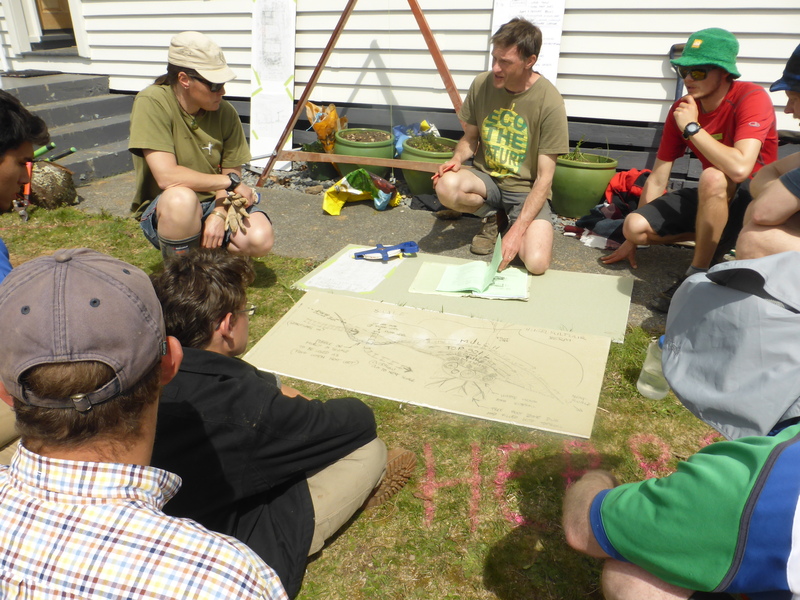 After an introduction by Leo, Dave and Lily, Dave went over the Permaculture Design for the Food Forest to set the days agenda. Then after a big warm up stretch session we all got cracking! 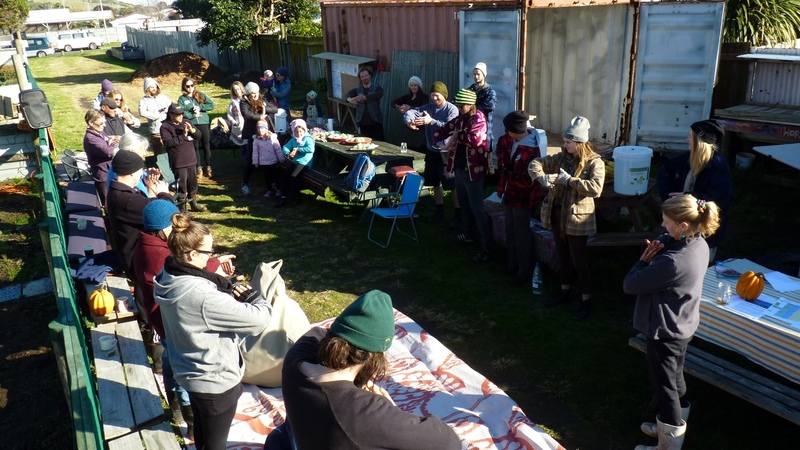 What a sight to see – all the weeks of preparation come to life in the hands of community, as the load was lifted up and shared between everyone. 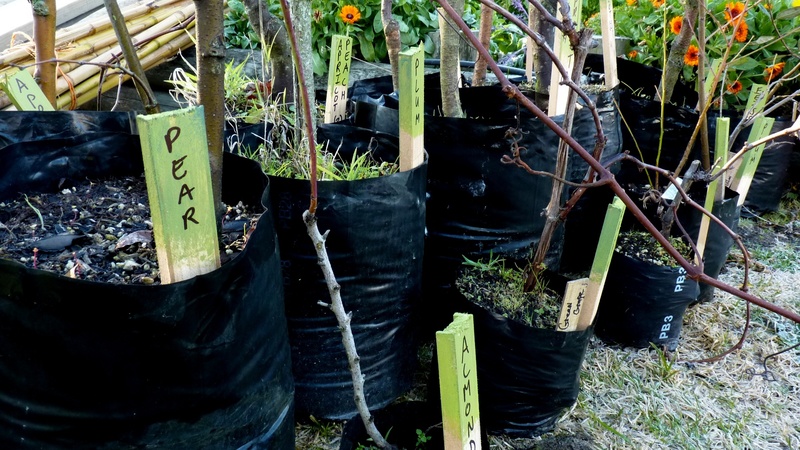 Around 40-50 participants planted over 30 trees (20 of these being fruit trees) and a guild of support species, including comfrey, lupin, lavender, rosemary, dill, oregano, coriander, berry shrubs, and garlic around the edges to help keep out unwanted visitors. Because the parent material at The Rock is a mercilessly nutrient-void sand, trees and shrubs were planted first in pre-prepared holes (refilled a month earlier with a mix of compost, manure and parent material), before cardboard and newspaper were laid around them to start the sheet mulch. A one meter radius around each tree was given special attention, building up the soil/compost layer a bit more to plant the guild species in. 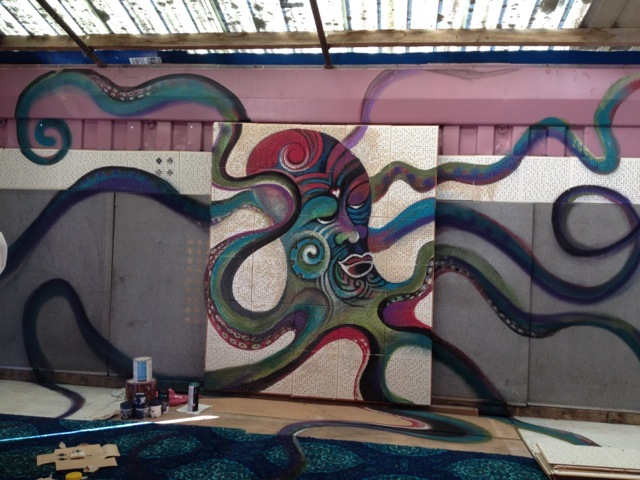 Much of this enormous task was completed on the day, with one whole section completely finished (yay!) but quite a few areas remained uncovered by both compost and mulch, and were completed by Rock members in the week following. 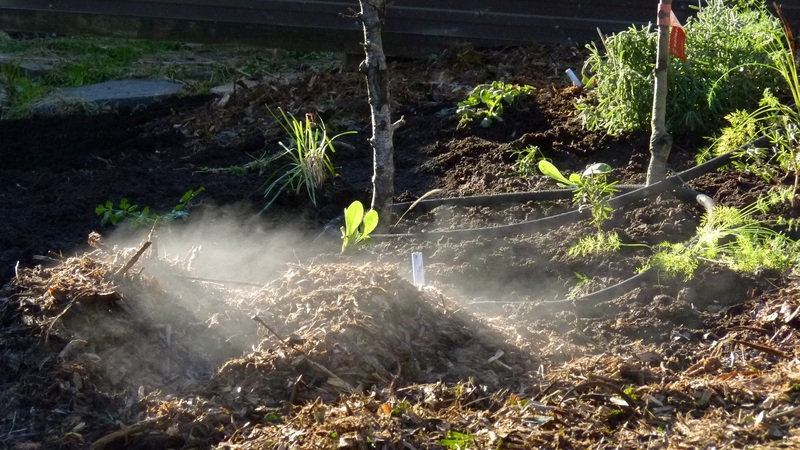 Between this area of sheet mulch, the empty space for a path has since been filled with sawdust to guide visitors around the edible permaculture forest. One seat got fully set up on the day, and the second seat has since been completed. Art also featured throughout the day, with Millie Newitt facilitating all the fruit tree signs being painted, in wild and wonderful colours and styles – Thanks Millie! The feast that took place at lunch time was spoken of for days afterwards. Rows of salads, soups, breads (Thanks Flaveur breads! ), cakes and more delectable home kitchen contributions were devoured in the sun, as we all gathered round on beanbags, blankets, chairs and picnic tables to a well deserved break with some smooth beats adding to the mood. The blitz was also blessed to have one Green Wizard floating about, casting spells of laughter and wisdom to many throughout the day. Thankyou Green Wizard. 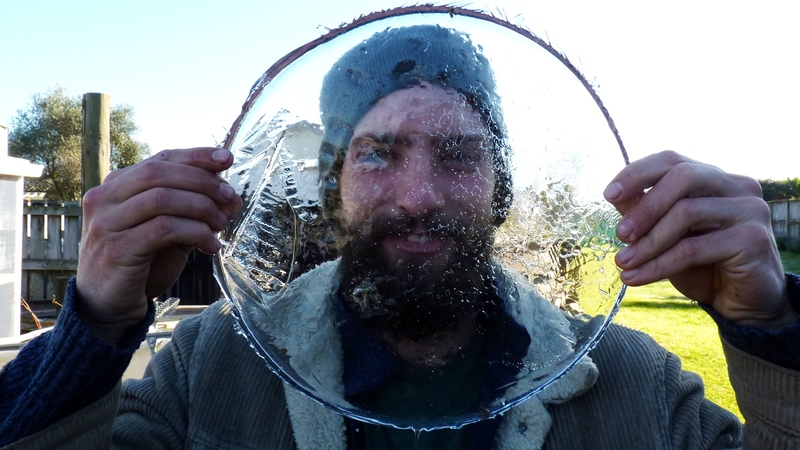 A huge THANKYOU TO EVERYONE who came down to The Rock from near, far, and in the cold of morn to create something incredible that day – a productive, regenerative, bio-diverse public space – that will be a positive fixture in the community for years to come. Together we all rocked it! You’re all welcome anytime and we welcome anyone who wants to check out the Food Forest and learn more about Fruit Tree Guilds. For more info on The Rock or to get involved, contact us at therockpapamoa@gmail.com. Follow up on previous blitz! 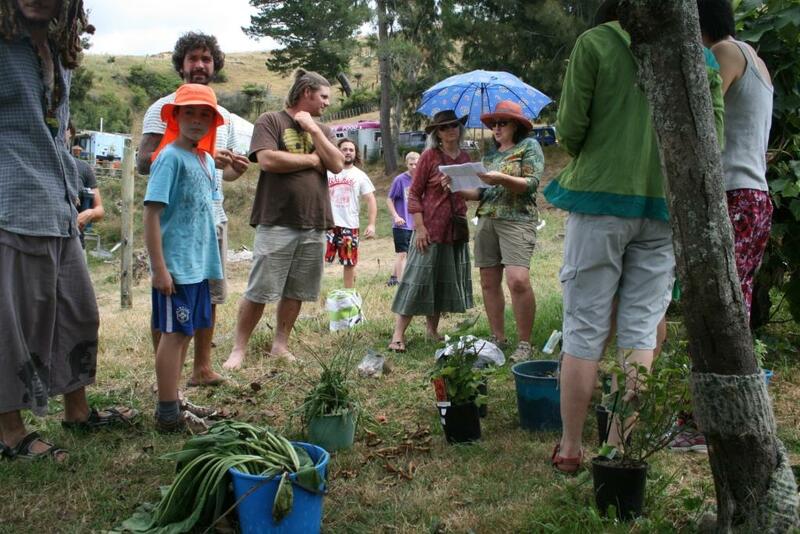 G3 garden group from Mount Maunganui visited the food forest of Christine Paris in Whakmarama. This was one of our earlier blitzes, designed by Hugo Verhagen. 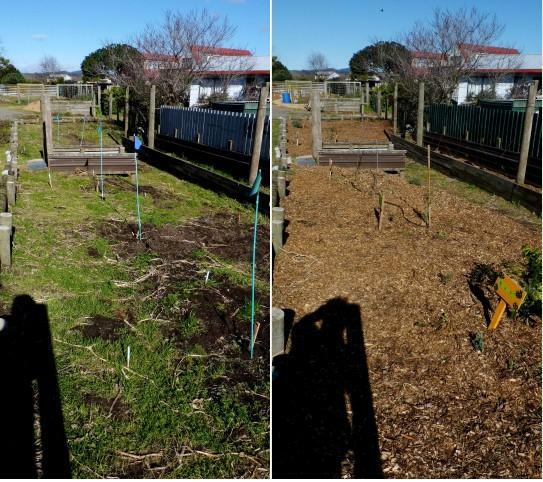 It is neat to see some photos and a follow up of how the swales are working to feed Christine’s fruit trees and how everything is growing. 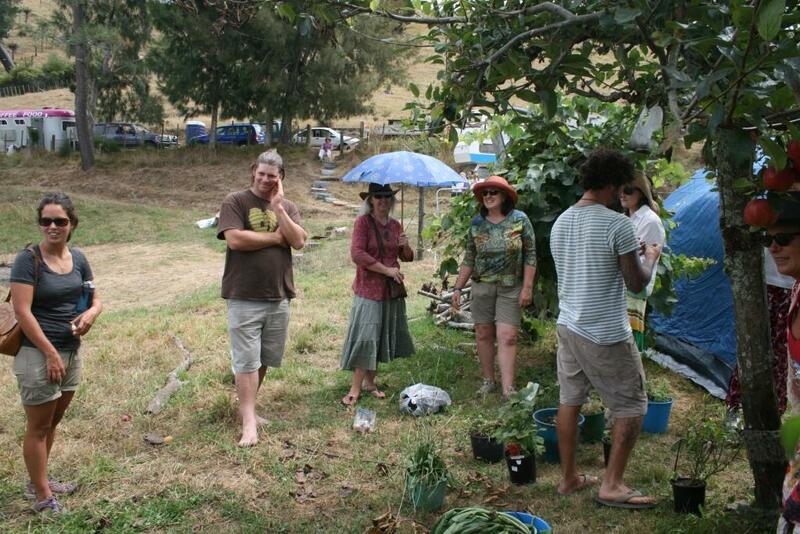 This is a photo of the blitz day, visit http://g3tauranga.blogspot.co.nz/ to see G3’s impressions of this permaculture property when the visited recently. 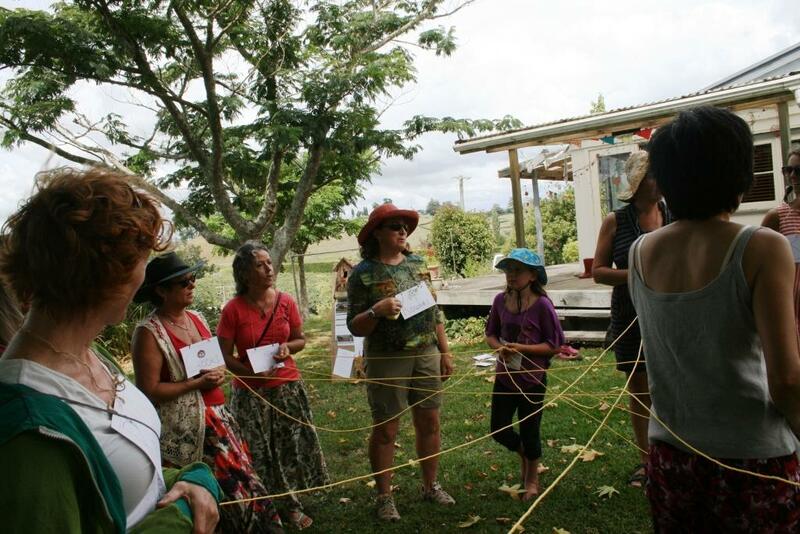 Although we had a lot of competing events happening on the same day because of Sustainable Backyards month, and the looming threat of Tropical Cyclone Pam, the mini-blitz at the Envirohub food forest was an intimate and successful morning that finished with a shared lunch including a salad of greens and herbs from the Envirohub gardens. 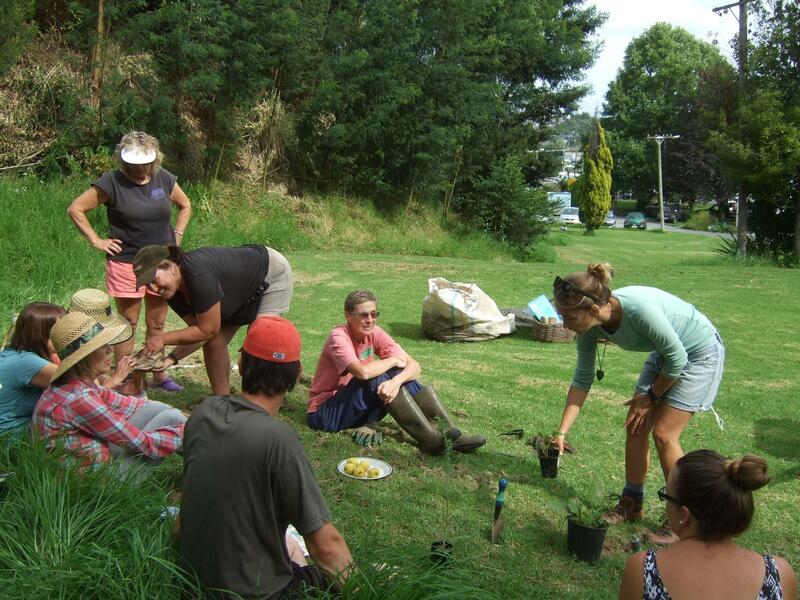 This was to be the first Permablitz to happen in a public space, and we had an intimate crew of around 10 people; including a few regular ‘permablitzers’ as well as some new to the Bay of Plenty and for whom it was their first Permablitz. 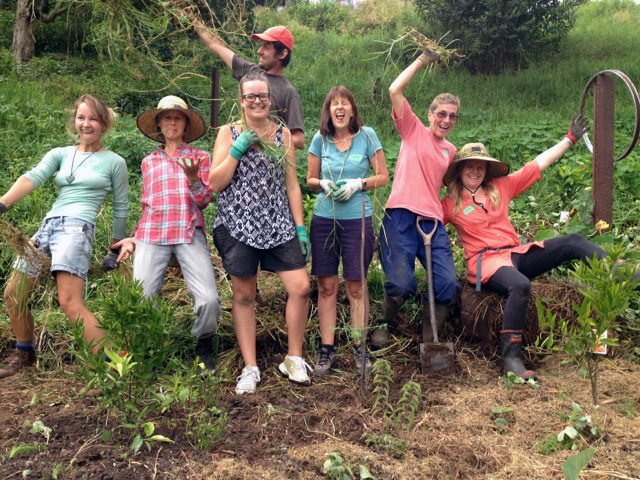 After moving the seedlings and supplies up to the food forest slope, we started the morning with an introductions circle at 9am, a few clouds in the sky but no sign of the wind and rain that were forecast for later that evening. Before we tackled the rampant Kikuyu grass smothering the recently planted citrus trees, we heard from Catherine Dunton-Mcleod about the history of Kikuyu arriving in NZ with the early settlers on ships that on the long journey had stopped in South Africa where the South African grass made a ‘splendid’ substitute for the grasses and plants that had already perished on board. Little did they know that in the future the rampant and hardy grass would become a bane to many gardeners. We looked at possible methods to control Kikuyu grass including using black plastic to ‘cook’ the grass in initial site preparations, using a slurry of hydrated lime to immediately alkalise the soil (Kikuyu likes more acidic soil), using a physical barrier of sheeting iron dug into the ground, digging a deep trench, and shading it out with rambling plants like choko (chayote), orangeberry or nasturtium. But we can’t be too hard on poor old Kikuyu, it was doing a great job in stabilising the steep bank and being the protective ground covering for the soil ecosystem beneath. So, once we removed the kikuyu grass from around the shallow rooted citrus trees we needed to replace that competitive yet protective soil covering with a diversity of beneficial ground covers, mineral accumulators, nitrogen fixers, pollinator attractants and pest repellents which would make up a fruit tree guild. 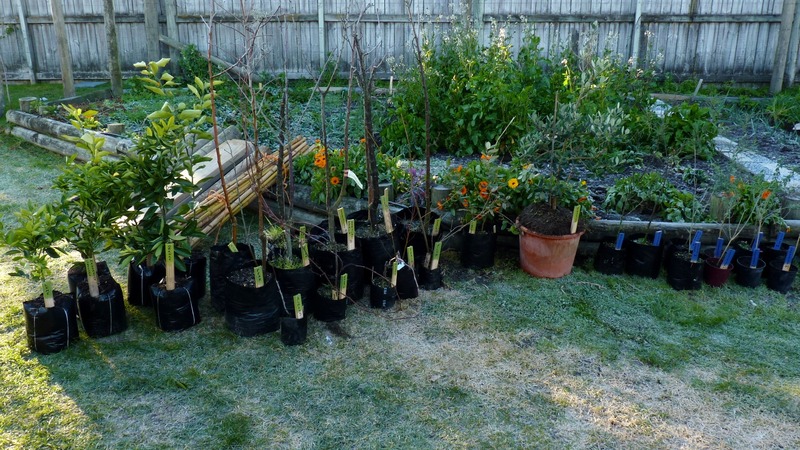 During a well deserved morning tea of juicy nashies and kiwifruit water we heard about what a fruit tree guild is and talked about the role each plant would play in the citrus tree guild. Comfrey, rosemary, sage, strawberries, tagasaste, wisteria, echinacea, asparagus, lavender, thyme, rose geranium, globe artichoke, horseradish, mint and oregano were strategically planted around the now cleared citrus trees according to height, sun angle, and root depth, while the live piano music from the nearby Historic Village market permeated throughout the blitz site. 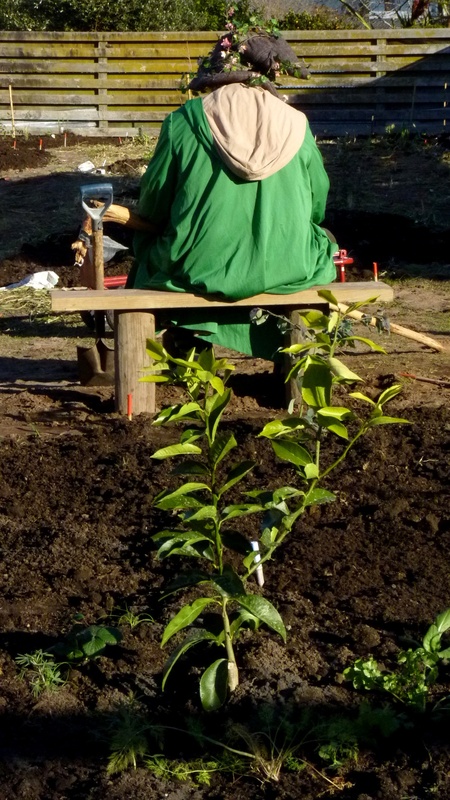 With their claustrophobic collar of kikuyu removed, the citrus trees looked much happier with their new plant companions- a quick mulch of compost and grass clippings was laid and we were out of time! We knew the new plants would get a good watering-in later that night with the predicted heavy rain the cyclone would bring. 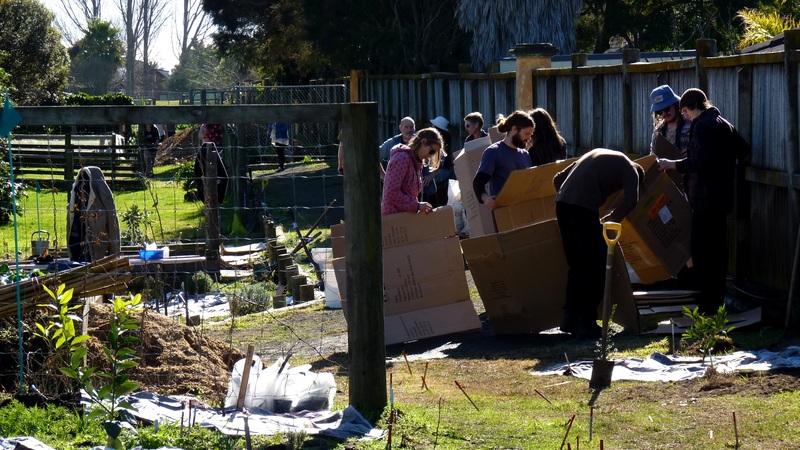 There is going to be a bit of on going maintenance to keep the invasive kikuyu away while the guild plants get established – get in touch with Noel Peterson from Envirohub if you would like to assist! 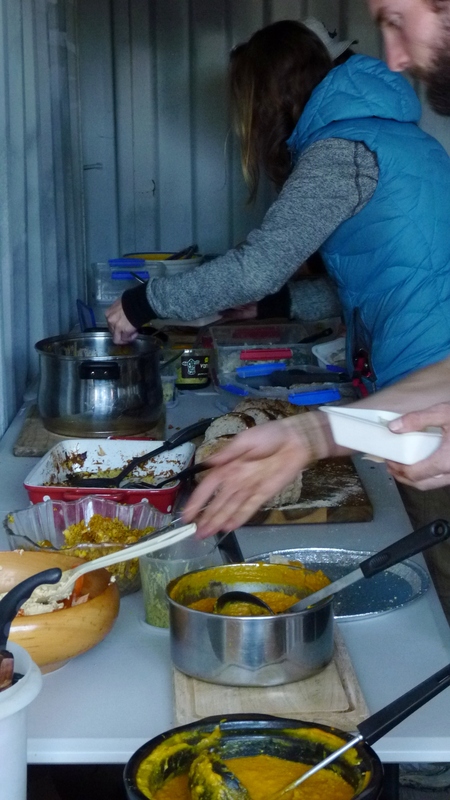 We finished the day with a yummy shared lunch while hearing Noel’s take on planting by the moon, and we got to take home a lucky dip of either dehydrated apples or cover crop seed of lupin, oats and mustard. Thanks everyone who came! It was a productive and fun morning! 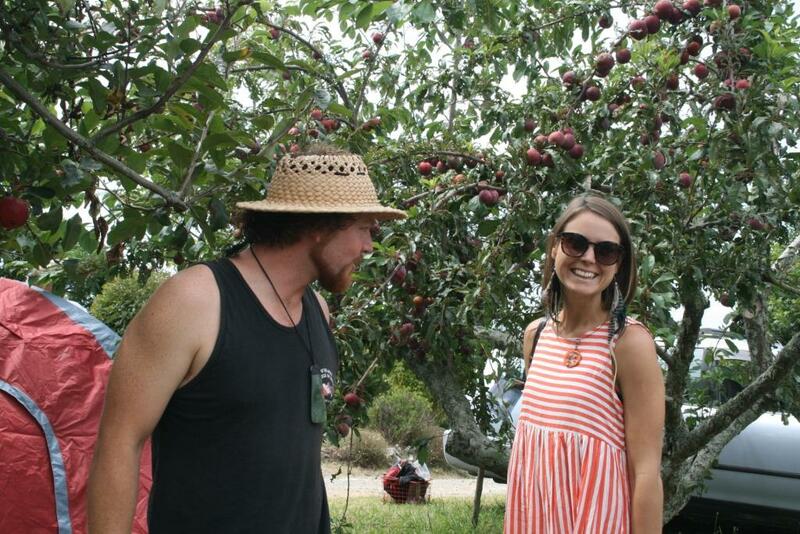 PermablitzBOP gave a workshop at the Nashi Fest this year discussing what a fruit tree guild is, how they work and their benefits. 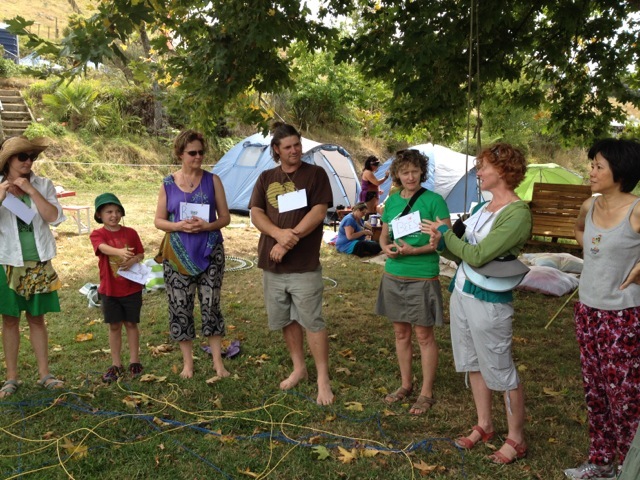 To begin the workshop we played a game to show how plants, people and animals are connected. Check out the photos below of the fun. Our facebook page has a neat video of Trish making a smoothie powered by a bike. There was a lot to be done at permablitz #20, with a great turn out and lots of enthusiasm the design was explained and everyone introduced themselves. 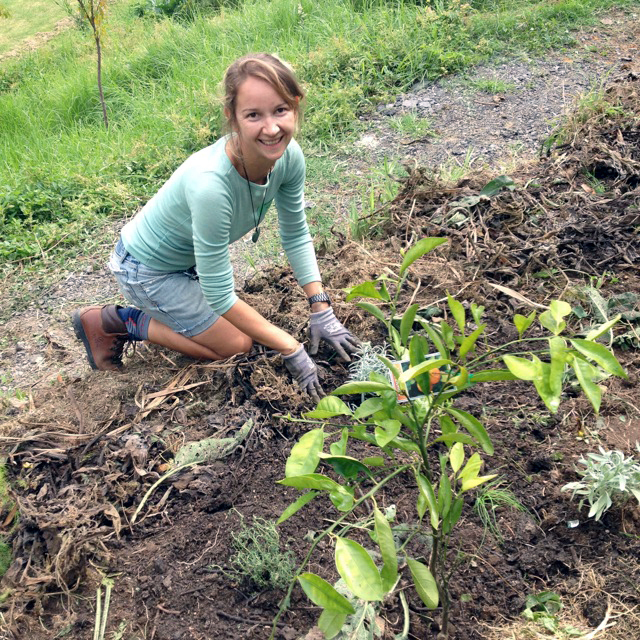 The hosts Marco and Teresa have only been on the property for a month, but with fruit trees that were gratefully gifted to them and plants to get in the ground – a blitz at their new property was in order! 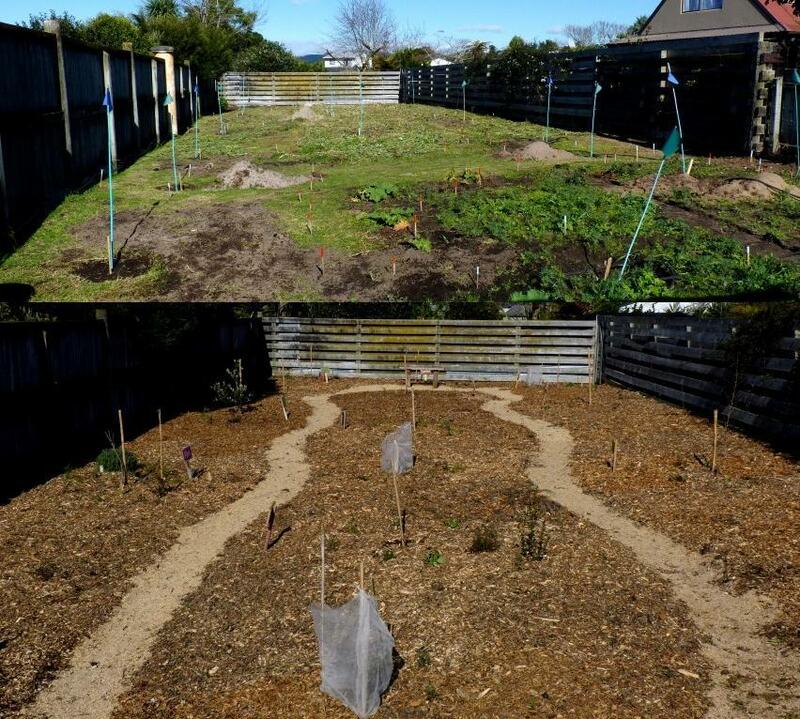 A forest garden was designed along the principles of Koanga Institute’s ‘Design your own Forest Garden’ booklet. This design incorporates the many layers of a natural forest with fruit trees, nitrogen fixers, comfrey for the potash and many other mineral accumulating useful and edible plants planted in their appropriate guilds. Swales were dug on this slope to stop the water running off and taking the nutrients with it! 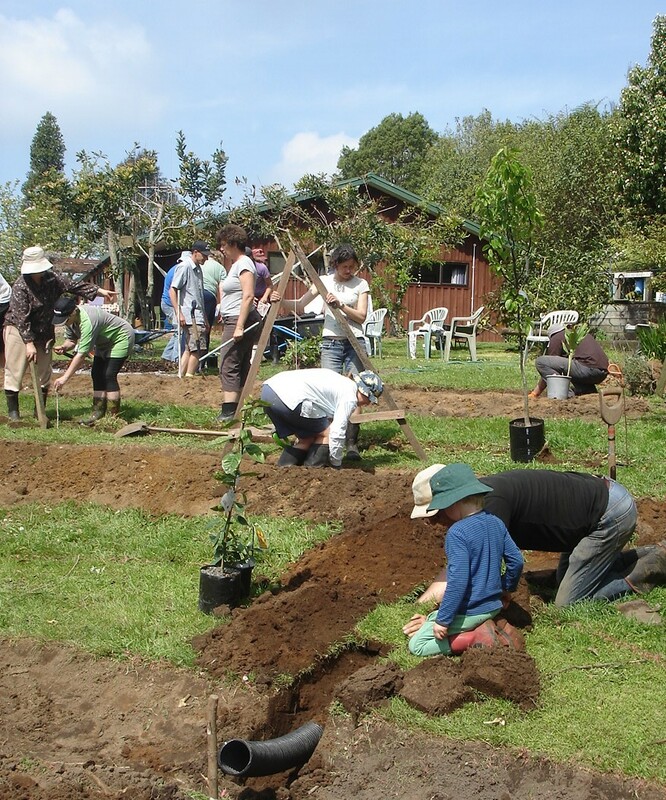 The idea is that the water will stay in the swale and permeate through the berm to feed the deep rooted fruit tree. 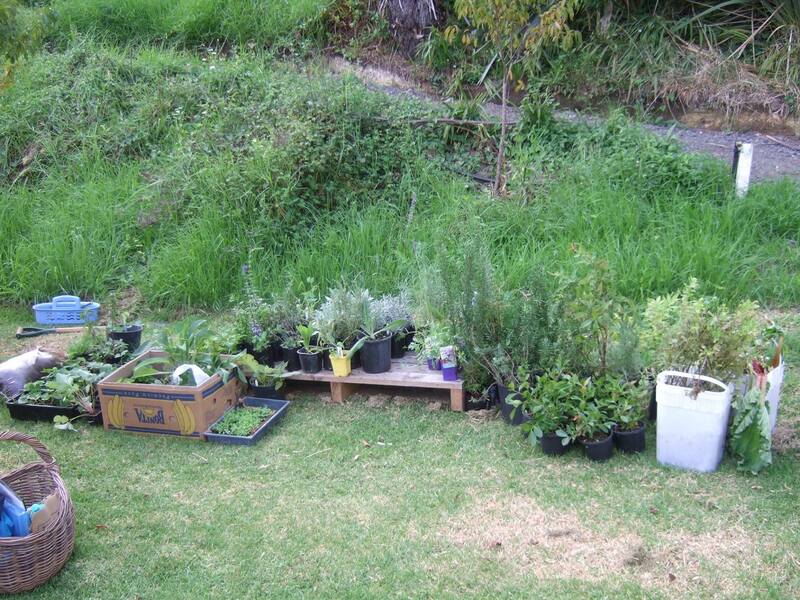 As well as planting the forest garden, an area to reuse water was created and planted out with water loving plants. 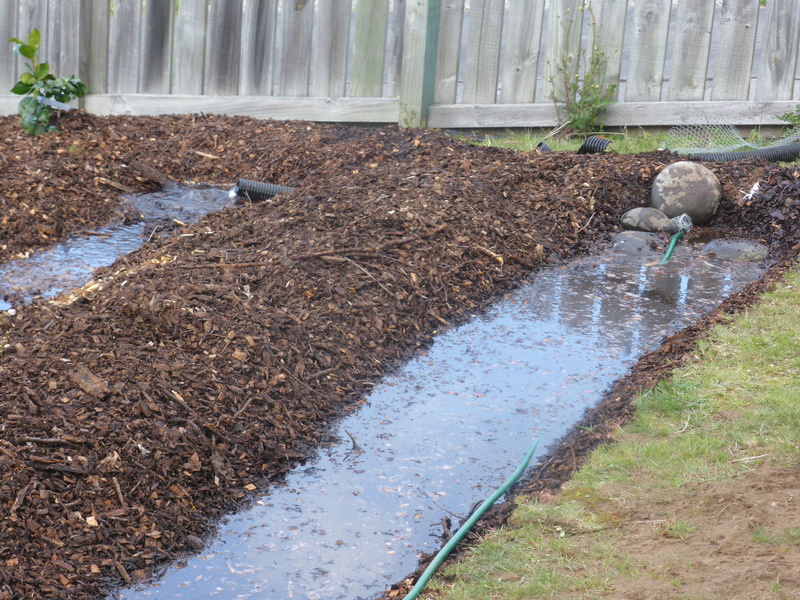 An area was dug out, the plants lovingly planted, wet cardboard laid on top, with a dripper line and then mulch. AND of course help was needed double digging beds in their zone 1 garden area! 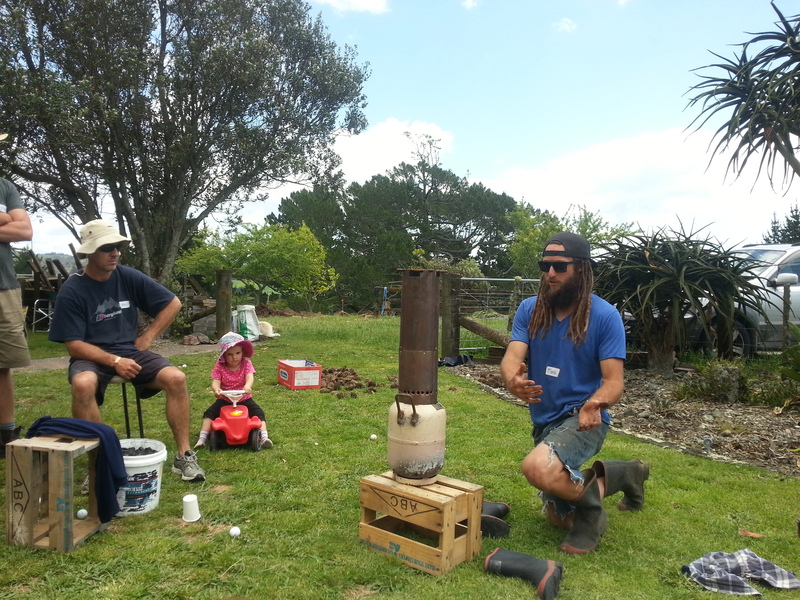 After lunch Marco gave a little workshop on biochar, how to make it, the uses and the benefits for the garden and farm! Back to work for a final push before people had to start heading home for the day. A drink or two was had at the end of the day marvelling at all the work that had been done. The power of people and the amazing achievements that can be made, never ceases to amaze us! 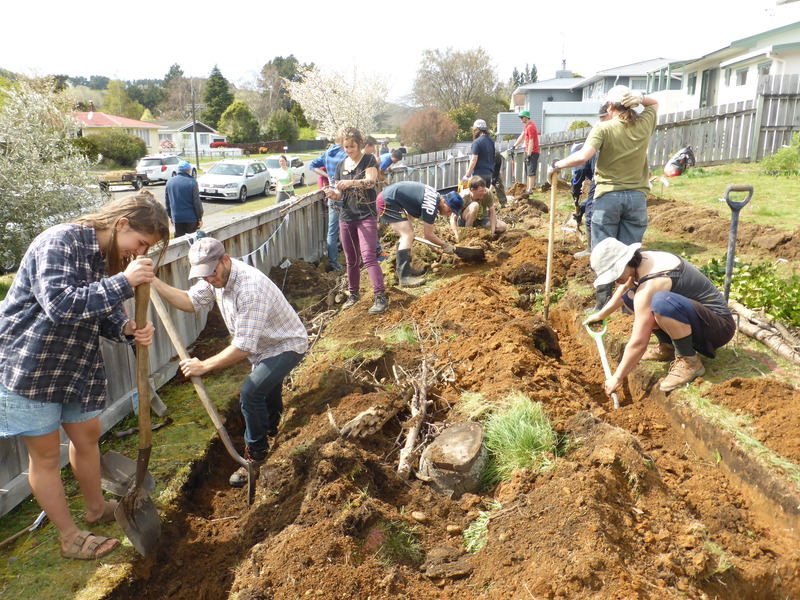 Turangi’s eagerly anticipated first permablitz got of to an exciting start! With a cool but sunny day forecast, a group of mostly strangers met for the first time at Boyd & Avis’ house. 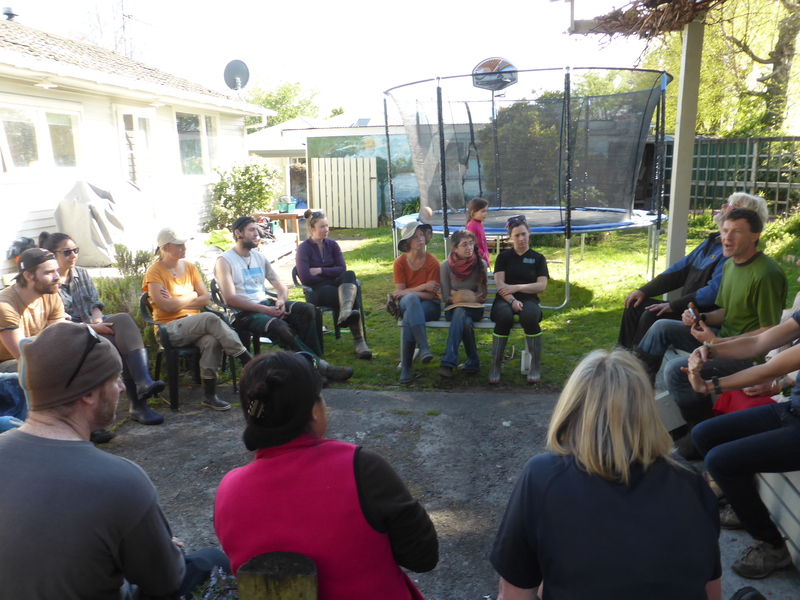 There were a contingent from Hillary Outdoors, and Awhi farm as wells as neighbours, locals and a cool dude Boyd met at the Tokaanu hotpools! Milo the fox terrier invited a few to play with him by presenting a tennis ball. We heard Boyd & Avis’ story as well as how permablitz came to be and what was the purpose of it all. Everyone seemed keen, so after a quick run down of the plan and a few jobs, we broke into teams and proceeded to transform another garden into something more edible and functional! The old concrete block edges came out in the blink of an eye and were re-positioned to make more garden bed space. Weeds were pulled and shrubs went flying! a Large pile of greenwaste was quickly attended by ladies on chairs who sat and chopped the woody stuff into smaller pieces. 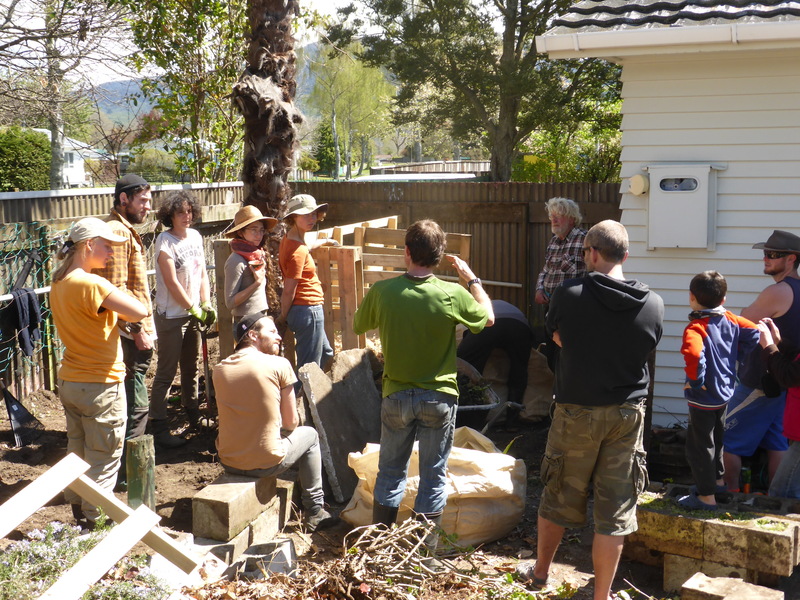 Liam built a new three-bin compost system whilst an old garden seat and pavers were ripped out to make yet more garden bed space. 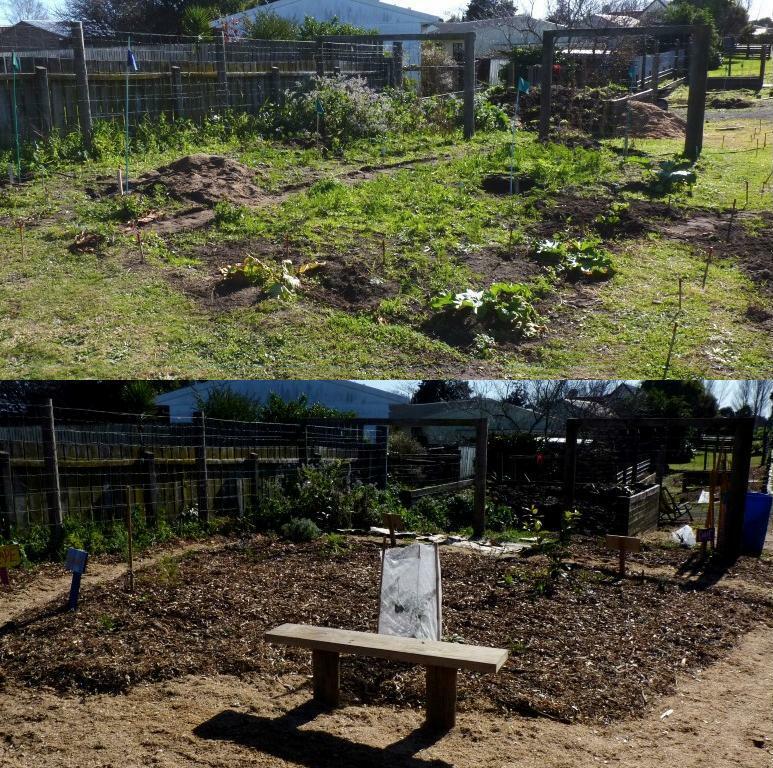 The rear gardens had plenty of compost added, a free resource from the Turangi Dump! The locals call it black gold here. Many were interested to hear that this ‘Black gold’ sells for up to $120 per m3 in larger towns. Here the council struggles to give it away! Lunch was welcome ravenously as the day started to heat up. 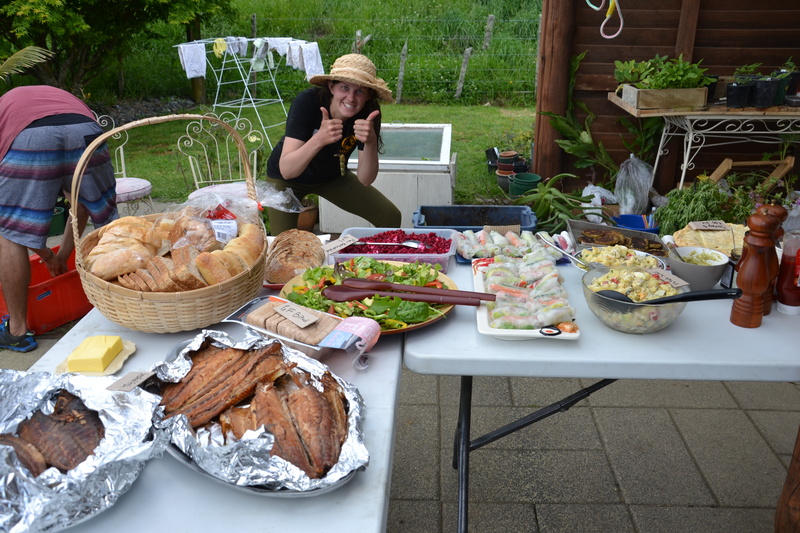 We had BBQ’d sausages, some great chicken soup and sandwiches. All loving prepared by Avis, Thanks Avis! A few of the senior neighbours went home, but their input was greatfully appreciated, they had chopped up a great big pile of woody waste for us! After lunch, we stopped for a seed sowing workshop put on by Carolyn. 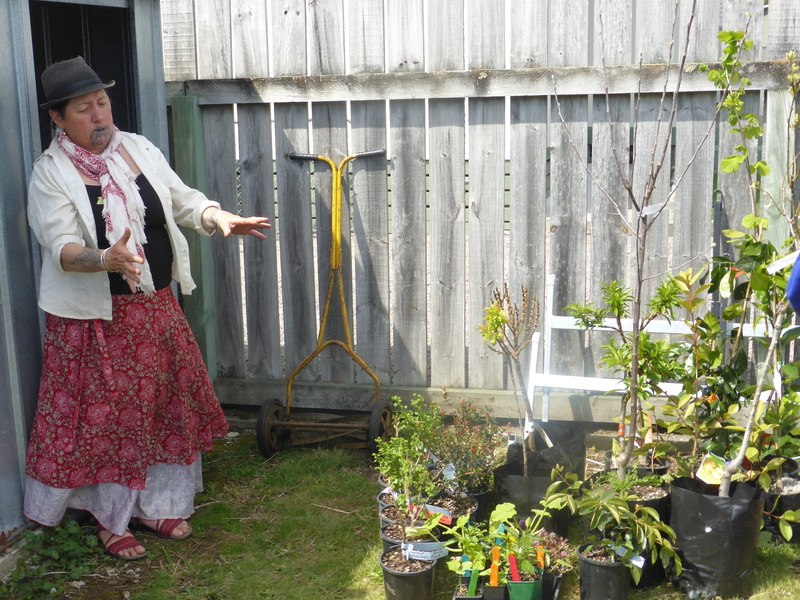 After that a composting workshop was obligingly delivered by permablitz novice, but senior gardener – Geoff from across the road. The compost bins took the rest of the day to fill, but were done with gusto! After the workshops, everyone went back to work eagerly. 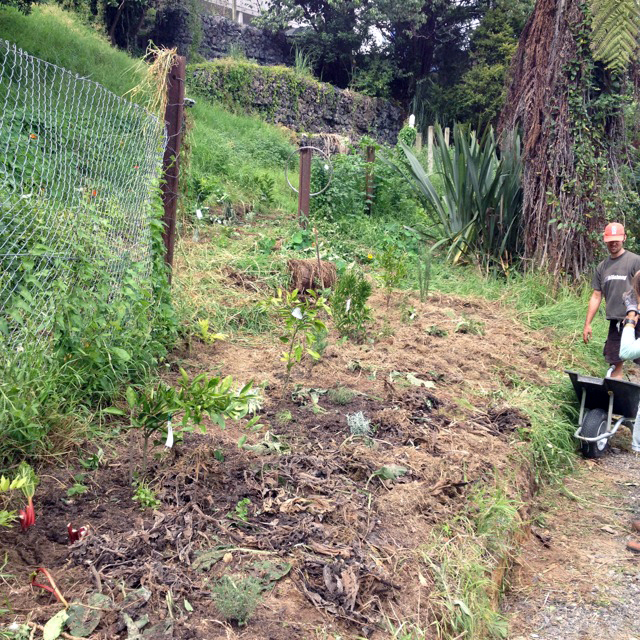 The whole team worked like a well oiled machine and the garden transformation was beginning to look really good. At the front of the property a few worked in isolation because of a dividing fence. 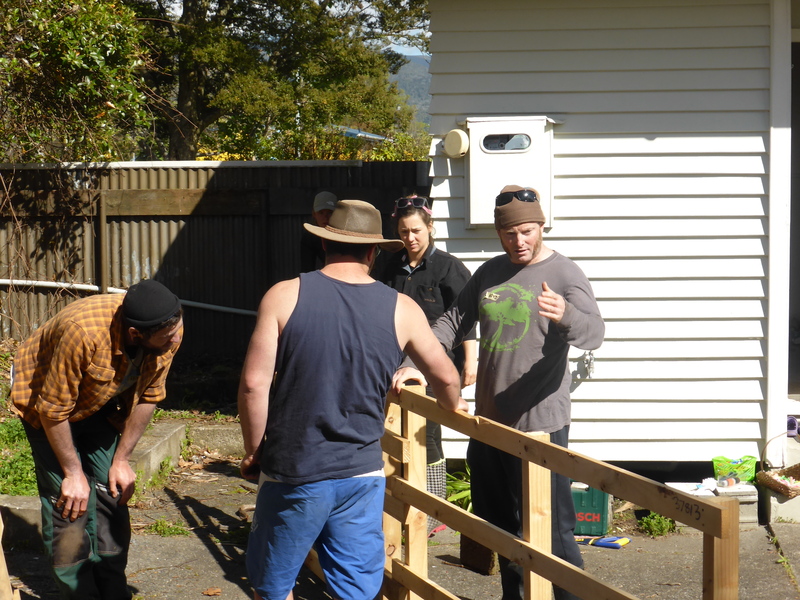 They were soon a part of it all as the fence was cut open to make way for a new future gate! A short stop for refreshments late afternoon, before a final push to the end meant we got it all done on time. Boyd and Avis spoke of how greatful they were as everyone sat round to have a drink together at our final debrief . A great day of good feelings, inspiration, friendship, teamwork and sharing! 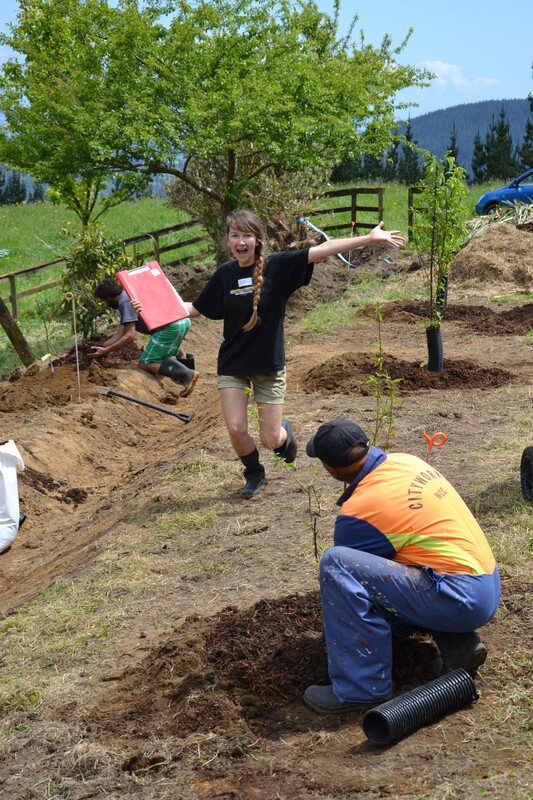 We hope that we can blitz again in Turangi someday soon, but we need someone new who wants to be a host to put their hand up! 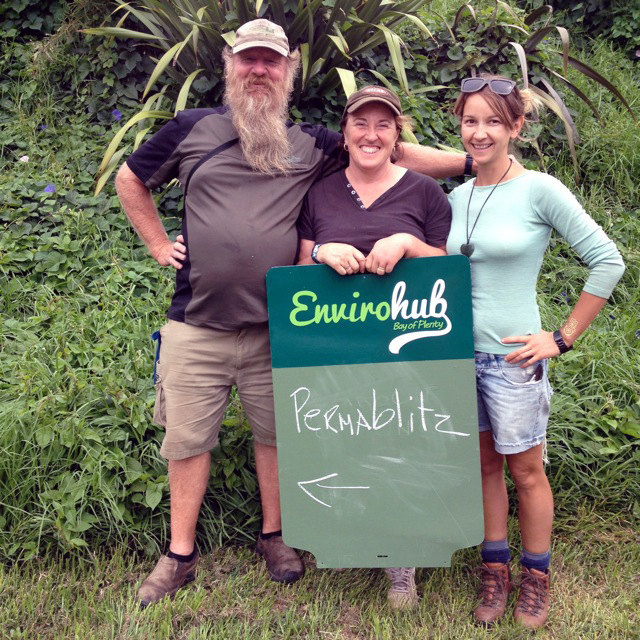 Please contact us through permablitzcninz@gmail.com if you are keen! Wasn’t it great to demonstrate that people are inherently good? Many thanks to all that came and thanks to Boyd & Avis for your good food and willingness to have a blitz at your place! 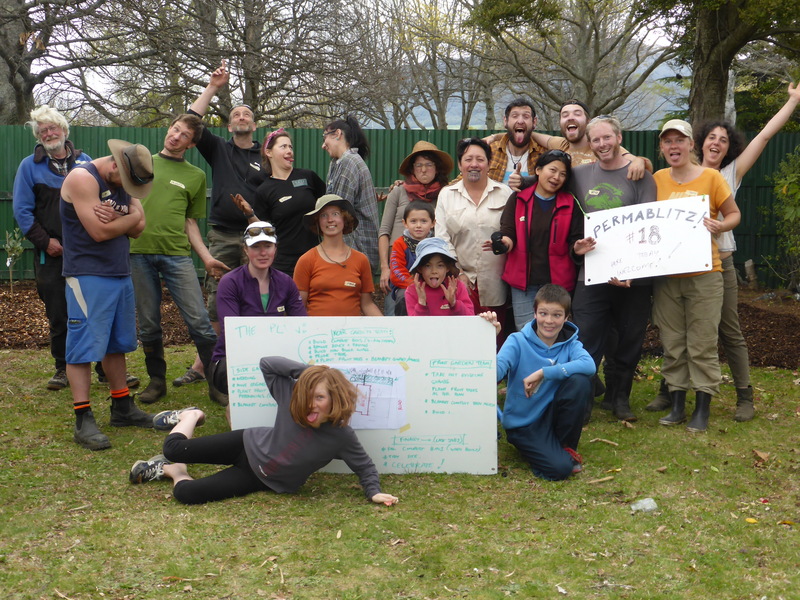 Turangi permablitzers, a very colourful lot!